Singer Johan Hegg of Swedish death metallers AMON AMARTH was unable to join his bandmates on stage at their January 17 concert in Plymouth, England after blowing out his voice a day earlier. As a result, the other members of the group played a largely instrumental set in Plymouth, with a special guest appearance by singer Jill Janus of tour openers HUNTRESS on the song "Guardians Of Asgaard". Fan-filmed video footage of Jill's performance with AMON AMARTH can be seen below. AMON AMARTH's latest album, "Deceiver Of The Gods", sold around 17,000 copies in the United States in its first week of release to land at position No. 19 on The Billboard 200 chart. The record arrived in stores on June 25, 2013 via Metal Blade Records. HUNTRESS recently spent time in the studio in Los Angeles with the production duo of Paul Fig (ALICE IN CHAINS, GHOST, RED LINE CHEMISTRY) and James A. Rota ("Sound City" movie, FIREBALL MINISTRY) recording its third album for an early 2015 release. 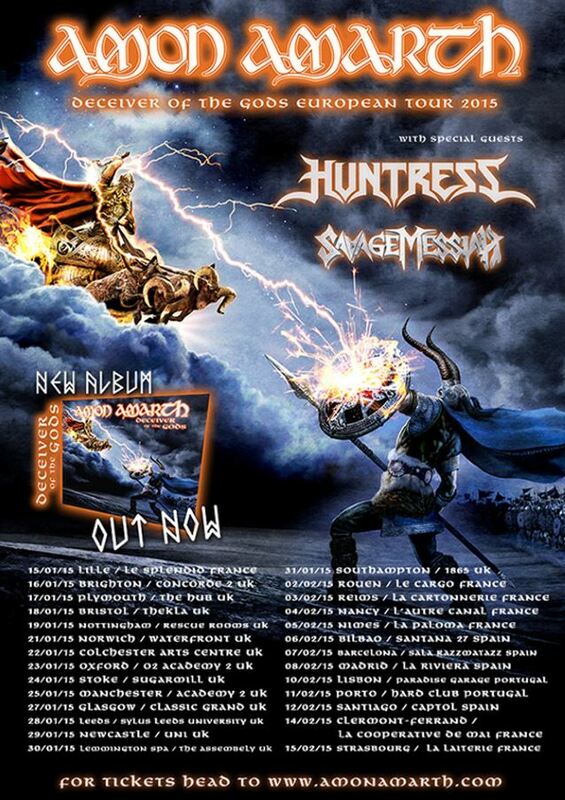 HUNTRESS' sophomore CD, "Starbound Beast", was released in June 2013 in Europe and July 2013 in North America via Napalm Records. The CD was recorded at Hobby Shop Studios in Los Angeles with producer Chris "Zeuss" Harris (SHADOWS FALL, HATEBREED, MUNICIPAL WASTE).